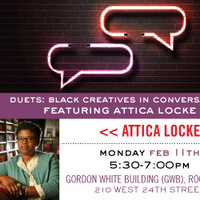 Attica Locke is an award-winning writer originally from Houston, Texas. Her work Pleasantville won the 2016 Harper Lee Prize for Legal Fiction, appeared on the long list for the Bailey’s Prize for Women’s Fiction, and made numerous “Best of 2015” lists. Her first novel, Black Water Rising, was nominated for an Edgar Award, an NAACP Image Award, as well as a Los Angeles Times Book Prize, and was short-listed for the Women’s Prize for Fiction. Her second book, The Cutting Season, is a national bestseller and the winner of the Ernest Gaines Award for Literary Excellence. Locke’s most recent novel, Bluebird, Bluebird, features protagonist Darren Mathews, a black Texas Ranger, charged with solving a crime committed along Highway 59 in East Texas. A former fellow at the Sundance Institute’s Feature Filmmaker’s Lab, Locke has worked as a screenwriter as well. Most recently, she was a writer and producer on the Fox drama, Empire. She serves on the board of the Library Foundation of Los Angeles.